Augmented Reality (AR), a blend of Virtual components including Graphics, GPS and 3D technologies with staging experiences, annotation of real-time images of physical objects, location-based technology, customizable preferences to mention a few. This technology combines VR with the real world in the form of live video imagery that is digitally enhanced with computer-generated graphics. A recent survey by Gartner reveals that 40% of all organizations currently using or piloting AR found that AR technology exceeded expectations. It is an emerging technology which has experienced immense popularity and growth. We at EGS focus on innovatively engaging the on-the-go consumer MAR (Mobile Augmented Reality) & Product development solutions. Our solution experts can do an end-to-end integration of Augmented Reality experiences to the Internet of Things (IoT) and enterprise mobile augmented solutions. Technical enablers for mobile augmented reality (MAR) are becoming robust enough to allow the development of MAR services that are truly valuable for consumers. There are very few limitations when it comes to Augmented Reality integration in either iOS or Android applications, giving the widest range of possible methods for implementation. We make your augmented reality app find where and when the user is accessing your content. From this, we can deliver exciting, targeted interactions within your application on both tablets and smartphones. We can take clients Augmented Reality needs and work with them to make sure they are getting the most from AR functionality. Our AR approach makes information interactive and easy to process. 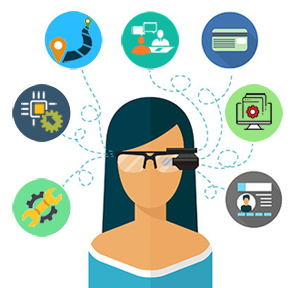 Our Augmented Reality solution apps can enhance unique dynamic visual cues in staging experiences, annotation of real-time images of physical objects, location-based technology, customizable preferences, etc. Healthcare AR apps: our AR apps are focused on rehabilitation, pain management, behavioral therapy, and surgical intervention. 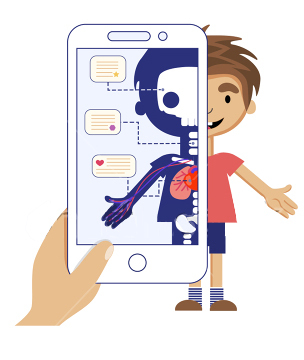 With the help of augmented reality applications, healthcare workers have an opportunity to gauge information about the body, how it functions, and treatment options for conditions that are complex or high-risk. Retail AR apps: EGS Augmented reality apps offer various businesses the chance to create a more interactive shopping experience with their customers as it offers the opportunity to virtually try the product they want to purchase. AR advertisements invite customers to engage with brands in a more real and visceral way than can be done with conventional signage, while AR enabled-apps enable shoppers to engage with signage and displays by adding new layers of interactivity. Financial AR apps: Within a bank, AR has the potential to transform productivity. Data visualization is a key tool for traders needing to make important data-driven decisions quickly. It will impact on interact with customers, train employees, provide services, and manage data. We integrate use AR technology to Mobile applications which enable users to view and pull up data on houses for sale as they pass them. Real estate AR apps: Our real estate AR apps create a believable illusion of comfort that may become a defining point in sealing a deal. By turning an empty and lifeless house or apartment into an individually furnished living space, you can make a more lasting impression on your clients. It is important for real estate agents to embrace the technology being offered, so they have the best chance of providing a quality experience for both buyers and sellers. Tourism AR apps: Take advantage of AR to bring your sightseeing tours or museum/gallery rounds to the next level. Augmented reality enables you to have a 3D virtual tour of the hotel to be booked on your mobile itself. We create AR apps that guide tourists through specified locations, showing directions, historical info, and even useful local ads. You can virtually explore each and every room to know all the details like, space, furniture and interior décor within them. They also enhance the impressions of the visitors of your museum or gallery by adding interactive and immersive content to selected showpieces. Manufacturing AR apps: Our customized, enterprise-level AR apps give designers and engineers a simple platform to collaborate, track feedback, and quantify the design. Our AR technology assembles the processes, where they are able to reduce cost, increase efficiency, and improve the overall production. The hands-free, interactive technology allows workers to see and hear part assemblies, instructions and processes in real-time, and make adjustments wherever and whenever they are needed. Vuforia, Android ARCore, Wikitude, Kudan, AR-media, Layar Ayla Networks, Unity 3D, 3DS Max, Arrayent, Clear Blade, Everything, IBM Watson, iOS ARKit, ARToolKit.